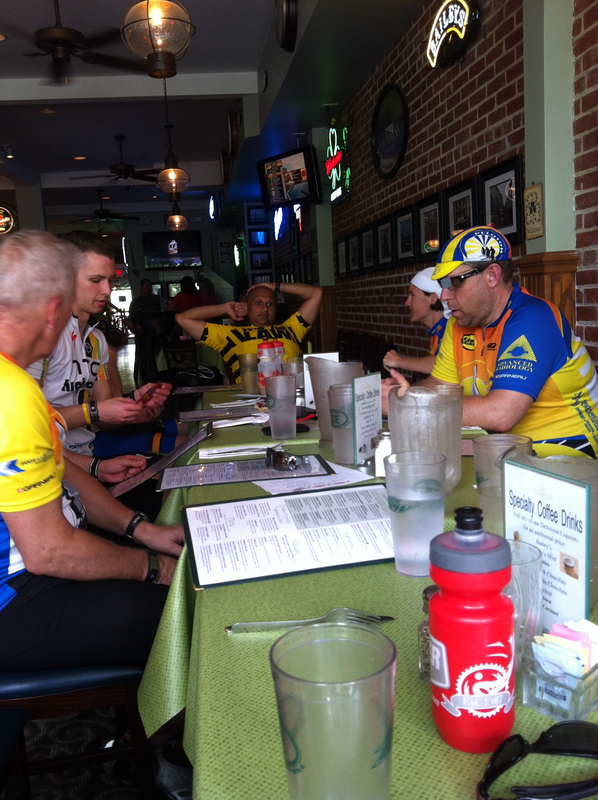 The Severna Park Peloton held it’s 14th version of our twice annual Ocean City Bike Ride. Day one has us riding from the Bay Bridge in Stevensville, MD to Ocean City, MD. Day two is the return trip. Once again this spring, I was able only to participate in day one’s ride. These rides are our “premier rides”. They have their own traditions, customs, and qualities. My ride started as I left home at about 6:30 am to ride to the Jones Station Park and Ride where I would be meeting up with Mike, Clint, Sebastian, and for a ride across the Bay Bridge. My car is in the shop, and it just made sense to ride the easy 3.5 miles. I carried with me a backpack with clothes to change into for the dinner and return trip, as well as my decorated bike. 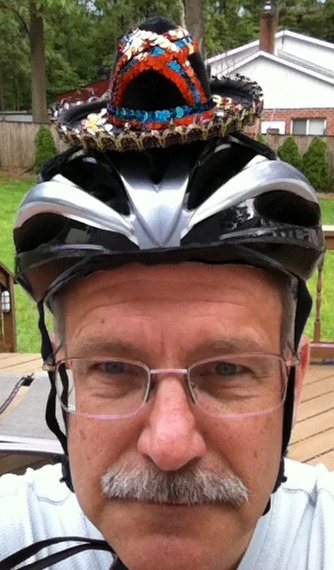 Yes, the bike and my helmet were decorated. 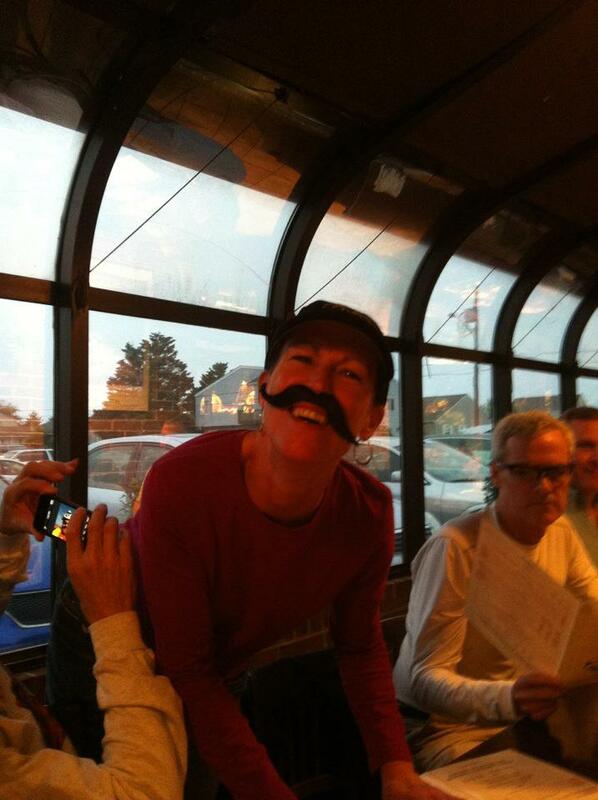 This ride was on Cinqo de Mayo and part of our promo material suggested “costumes” or bike decorations. My preparation was the most elaborate, as it turns out. I supplemented my own grey mustache with a black stick on mustache. I wore a miniature sombrero on my helmet and a serape around my headlight. An “Ole” Sombrero printed card served as my spoke card on my rear wheel. 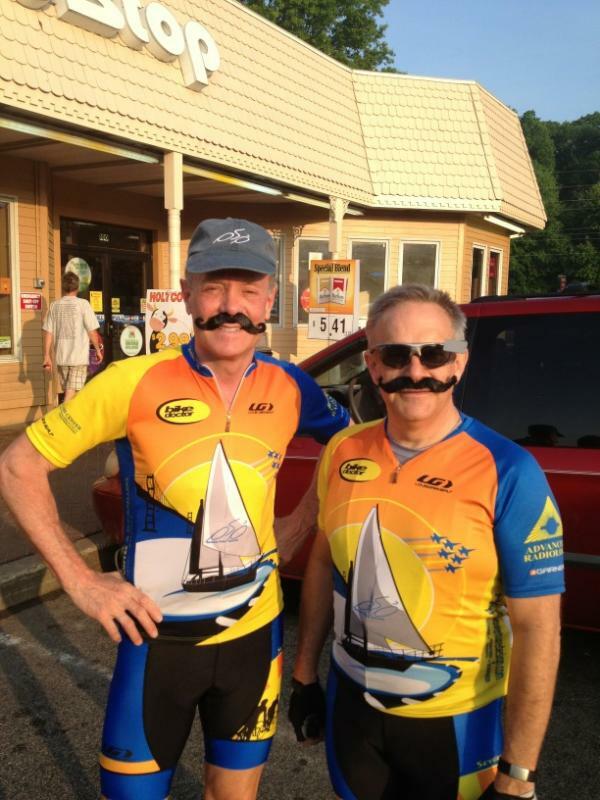 I bought Clint a matching mustache, and he wore his nearly the entire ride. Not only did this get-up earn me the award for the best “costume”, but unfortunately other than Clint’s mustache, I was the only one who did anything special. It made me the envy of all the other riders. We arrived at the Stevensville Middle School on time for our 7:30 am meet up and 8:00 am planned departure. By the start time, we had 16 riders ready to go. I dashed ahead to get a video of our start. I must say, we were a pretty impressive group heading out of town for this great ride. The skies were mostly clear. Temperatures were promising to hit 80° along the way. The chance of rain was slight. What a great time for a bike ride. We soon discovered that Rick, one of the “newbies” to this ride was not going to be able to hold our pace. He is a recumbent rider and fell off the pace early. We remained mindful of him, slowing or stopping or sending riders back to him to help bring him forward. Eventually he instructed us to move ahead at our pace and he would rely on the cue sheet. That was actually quite gracious of him. Our support van driver checked in visually with him often to make sure he was safe. We were able to cross Highways 50 and 301 safely, if not without some tension. There is just no easy way to cross these highways, and the crossing of Highway 50 is especially challenging as drivers come up over a slight rise on a curving ramp at 60 mph with about 100-150 yards of visibility. At least the sight lines are better for the crossing of Highway 301 just minutes later. 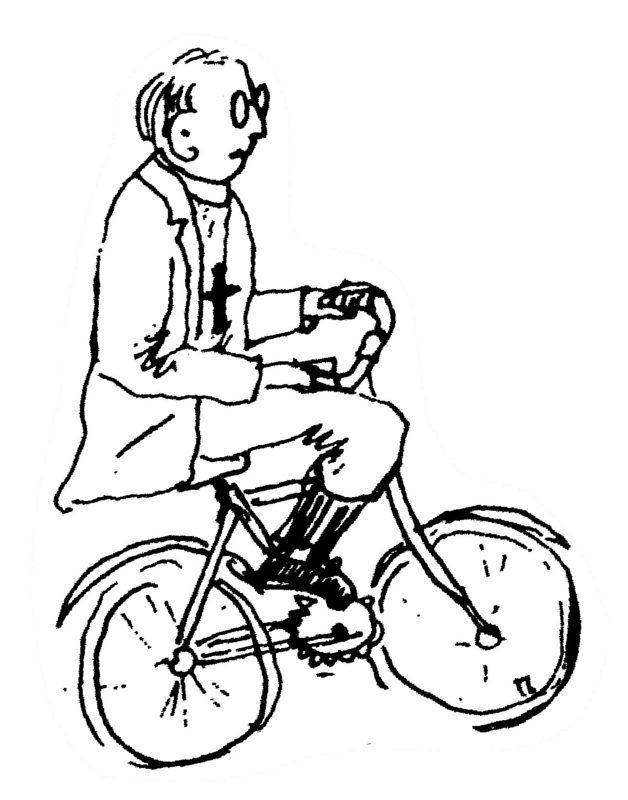 With those crossings behind us, it is a simple matter of turning the pedals, enjoying the day, and keeping the conversation going. We had a surprise visit by Chip who joined our ride temporarily. He had a schedule conflict and joined us from about the crossing at 301 to Dave’s place. It was good to see him out, keeping his string alive on the route he designed. The miles flowed by, and by about 10:15 we had arrived at our breakfast stop at Dave’s Place. Dave’s Place is a “biker bar” (motorcycles, not bicycles) just outside Ridgley, MD. Clint and some others stumbled upon it years ago when they needed some respite from some very cold temperatures. Mary Ann, the owner, has agreed to open the place early for us twice a year. She makes us breakfast sandwiches to order, bakes brownies and cookies for us, runs a raffle give-a-way, has pitchers of water and pots of coffee waiting for us. It is a perfect set up. This year, she announced that the bar had no potable water because of a water main break, but we still had bottled water and nothing was lacking. We descended on the food as if we were a hoard of locusts, eating and drinking everything in sight. You see, by now it had warmed up to the upper 70’s to lower 80’s and we had exhausted our water supplies on the bikes. Some had never ridden that fast before, and were ready for a good break. Mary Ann is good-natured and it is good to see her. She feels like a friend to many. Photos of us hang in the bar, which I’m sure gives the regular patrons a real laugh. As we prepared to push off for our lunch stop, we took the obligatory photo. Newbies had their hugs (the pole for pole dancing was not up). We slathered on sunscreen in deference to the bright and strong morning sunshine, and worked extra hard to push our bloated bellies out of the way of each pedal stroke. Over the next few hours, we covered miles, found pee spots, had very fast pace lines going and slowed to get a breather. Sebastian had a flat that was fixed in quick order. Somewhere along the way to lunch, we crossed the stalled frontal boundary. The clouds rolled in. The winds picked up. The temperatures dropped. By 1:20 when we arrived in Milton for lunch, it was 63°. Temps had dropped 20 degrees and as we looked at the weather forecast for the rest of the course, I got concerned. I had neglected to consider the forecast for our whole route, and was woefully unprepared. I spent lunch fretting and planning for what lie ahead. Lunch was at Irish Eyes in Milton. We sucked down pitchers of water. Many of us had a very tasty “Grown Up Grilled Cheese Sandwich” complete with a cup of tomato bisque soup. The lunch stop lasted longer than most of us wanted. It was nearly 3:00 by the time we were ready for the shortest leg of the trip, less than one mile. I changed socks and I added a spare jersey over my kit (complete with a piece of newspaper under my jersey as a wind breaker). Next stop … The Dogfish Head Brewery, with at least half of us wearing Dogfish Head jerseys. We were a hit in the tasting room. We blew in, ready to try our 4 samples. Customers and staff alike wanted to hear our story and were all amazed that we were riding to Ocean City … and that we had already come from the Bay Bridge … and that we do this often. But, feeling the press of time, and the possibility of worsening conditions, we moved out and on our way. Janet loaned me a pair of arm warmers that made all the difference in the world. We had hoped for some tail winds as we moved in a more southerly direction, but as is usual on the Eastern Shore, we encountered at least a partial headwind. It shortened pulls on the front of the pace line and kept everyone pretty tight in the group. Somewhere on this leg, the moisture started falling out of the sky. At first it was a barely perceptible mist. Then it intensified into a fairly heavy fog so that the surface of the road was damp and the wind blew the moisture onto our eye wear. Many riders removed glasses. I kept trying to stay ahead of fogging lenses and beads of moisture by frequent wiping and steady hard pulls on the front of the pace line. We just wanted to get to the hotel. It was cold and wet and windy, not the conditions we anticipated. Just as we had the end in sight and had a pace that kept us warm in the 55° temps with a full on headwind, Mike C hit a stone causing an immediate flat. We had 5-6 miles to go. Assured that he and a few others had matters completely under control, the rest of us pushed off and made our way quickly to the hotel. We were about an hour later than we had hoped. Sometimes on this trip we average 18-19 mph. Today, it was just over 17. The rest of the evening went quickly. We had very quick showers. We watched the Kentucky Derby. We had the shortest Happy Hour on record. We moved to our planned dinner at Lombardo’s. And by a little after 9 the van back to Severna Park was pulling out for a before midnight arrival home. What a good day. We covered 113 miles. There were no crashes. There were two flats and no real mechanical issues. We all avoided hypothermia. Camaraderie was good. I’m just sorry I wasn’t able to do the return leg Sunday. I wish my video camera cooperated a bit more, but I’ve captured a couple of quick videos, including the start and our arrival at Dave’s Place. [This just in: Day 2 riders arrived safely at the finish at around 4:00 pm] Congrats! Nothing says I mean business like a sombrero and a large mustache!